The director of the Edinburgh Festival Fringe has announced his resignation. Jon Morgan, who has been in the role just over a year, leaves the job only days after it was revealed ticket sales for the festival dropped 10% this year. The Fringe was hit by several problems, including the failure of a new computerised ticketing system. Mr Morgan, 46, insisted he had been considering the move for "some time" and that his decision had nothing to do with this year's difficulties. He said he wanted to return to working more closely with the artists. He added that he had not wanted to disrupt this year's programme by announcing his resignation before the festival began. 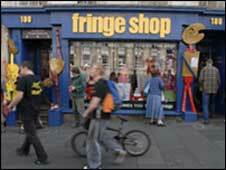 The director said: "I feel privileged to have worked for the Fringe. It is the greatest arts festival on the planet and plays an important role in developing and showcasing new performing talent on a world stage. "However, the role of Fringe director has taken me away from my first love of producing and presenting exciting performances to audiences and my intention is to return to that more direct relationship with artists and audiences." He added: "I have been considering this for some time, but felt it was important not to announce my departure before the festival so as not to impact on this year's festival. "Following discussion with the board I have now decided to step down with immediate effect." Mr Morgan stressed that he would "contribute fully" to an independent review into the problems with the box office system. Baroness Smith, chairwoman of the Fringe Society Board, said: "The board is very grateful to Jon for his significant contribution to the Fringe at a challenging time of great change. "In the short time he has been in post he has dealt with an unprecedented range of challenges. "The board appreciate his future career aspirations and we would like to thank him for all his hard work and to wish him well in the future." William Burdett Coutts, Assembly Theatre director, said: "I think Jon has done the right thing. He is an extremely nice man but it is the honourable thing to do. "Paul Gudgin started the interest for a federated box office and I think Jon then got caught up in the enthusiasm for it. "Jon made several errors as did the Fringe Board. The (ticket) system was proven not to work at the Brighton Festival in May but they didn't take this into account. "Also they made the mistake of testing a live system during the festival. "It has woken us all up to the problems which face us running the Fringe." Simon Peers, director of Edinburgh Theatre Arts, said: "Our theatre group had massive critical success and of course we didn't get the audiences to match. "Every ticket is precious and the failure by the box office meant companies were denied very valuable ticket sales. "The fringe society were secretive about everything, there was a real lack of transparency about what we heard on the outside and what was happening on the inside. "I'm not surprised at all given the complete managerial failure of this year's IT system. "If it wasn't for the likes of the Assembly Rooms and others stepping in, this years fringe would have failed." Steve Cardownie Edinburgh City Council events champion said: "We welcome Jon Morgan's intention to continue to contribute towards the review into the Fringe and we look forward to seeing the results. "The Fringe is still a healthy organisation and a new director will inherit a Festival with a bright future in Edinburgh. "On behalf of the Council, I would like to wish Jon all the best for the future." 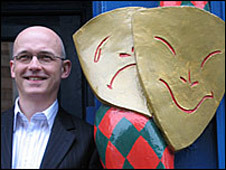 Prior to his role as Fringe director, Mr Morgan was executive producer with the Contact Theatre in Manchester. He has also worked with the Scottish Arts Council on its bid to establish the National Theatre of Scotland and was general manager at the TAG Theatre Company in Glasgow.